I got the recipe for Chicken Tagine, but I still cannot eat chicken as yet. So I used Baby back ribs(pork). You can use Beef ribs, or Lamb. This tagine set I got is the medium size version. the ones you see selling at Tangs or Robinsons are most likely the Le Crueset versions which are huge, heavy. I find this model more manageable and easier to store. Here's my tried and tested recipe, along with pictures. 1. Put tagine pot on the stove, add 1 tbsp corn oil to heat. 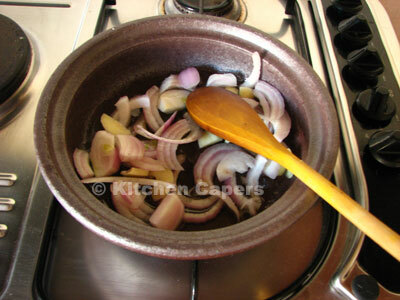 Add garlic and onions to fry till it sizzles. Use a wooden spatula to stir. 2. 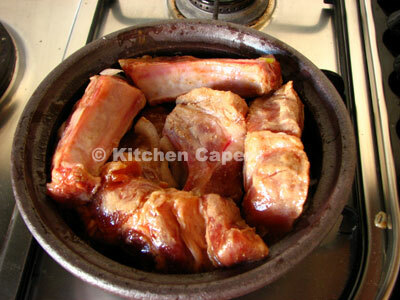 Add ribs on top and cook over medium heat. 3. Turn the ribs over to get an even browning..
4. 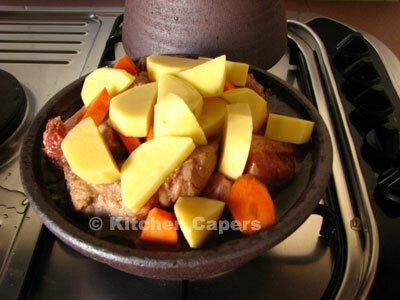 Add carrots, potatoes on top of meat. Pinch salt and sprinkle on top. 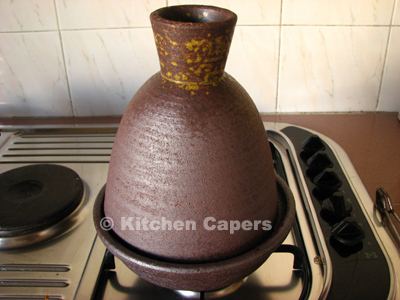 5. cover with Tagine cover and lower heat. Let it to cook for 45 mins. 6. Remove the cover and add tomato wedges. Cover it again and continue to cook for a further 5 mins. 7. Turn off fire. Serve it in the Tagine pot. I didn't add any liquid other than the corn oil. 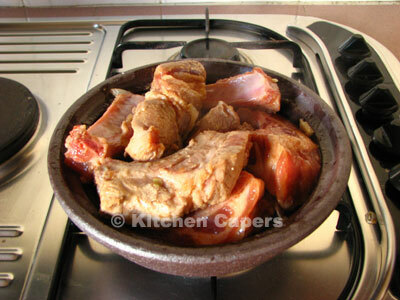 After cooking, the pot is filled with juicy essence from the meat, vegetables. If you want this soup to be more thick, then remove all the meat, veggies, and cook the gravy with a cornstarch mixture. 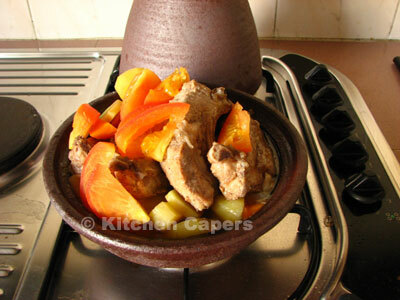 About how to use the Tagine first time, I'll do a separate post. My this sounds and looks so tasty, Gina!! A tagine has been on my 'wish' list for a while, I think it's time to do something about it. an old cook still looking for new ideas!! me too! at least a year wishing for it!